How To Cook a Frozen Turkey: Watch the Video. Heat the oven to 325°F. Arrange a rack in the bottom third of the oven, remove any racks above it, and heat the oven to 325°F. Unwrap the turkey and place it breast-side up on of a roasting rack set inside a roasting pan. Don't try to remove the giblets or season the turkey right now. How To Cook a Frozen Turkey. Makes 1 turkey…... Directions. Stuff your turkey as you normally would. Open one brown paper bag inside another one. Butter the inside of the inside bag real well. Slide the turkey into the brown bags, fold up the end of the bags and staple together. Open the top of the cooking bag and add a tablespoon of flour. Twist the top of the bag to temporarily seal it, and then shake the bag to distribute the flour.... Place turkey in the hand, and tie opening of the bag using kitchen thread and place it on a large baking dish. 6. Poke 5 to 6 holes in the bag to escape the steam, and bake in the oven until it gets light brown in colour and the internal temperature reaches 180 F.
Place turkey in the hand, and tie opening of the bag using kitchen thread and place it on a large baking dish. 6. Poke 5 to 6 holes in the bag to escape the steam, and bake in the oven until it gets light brown in colour and the internal temperature reaches 180 F. how to download streaming video firefox Turkey may be thawed in cold water in its airtight packaging or in a leak-proof bag. Submerge the bird or cut-up parts in cold water, changing the water every 30 minutes to be sure it stays cold. Cook the turkey immediately after it thaws. A “turkey-size” roasting bag is what you’ll need, and at this time of year, it’s pretty easy to find. A roasting bag will be able to cook a turkey as small as eight pounds and as big as 24 pounds! Place turkey in the hand, and tie opening of the bag using kitchen thread and place it on a large baking dish. 6. Poke 5 to 6 holes in the bag to escape the steam, and bake in the oven until it gets light brown in colour and the internal temperature reaches 180 F.
Directions. Stuff your turkey as you normally would. Open one brown paper bag inside another one. Butter the inside of the inside bag real well. Slide the turkey into the brown bags, fold up the end of the bags and staple together. Place your unwrapped turkey in a large trash bag and seal tightly. 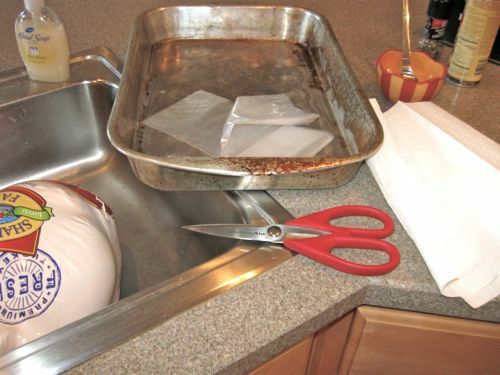 Place the double-wrapped turkey in your sink and run cold water on it until the sink is full. Change the water every 30 minutes to keep the bird surrounded by cold water. It will take about 30 minutes per pound to thaw.